“Oh no, here we go again,” thought Laura as she sat in her weekly engineering meeting. Two of her engineers, Rob and Rachel were at it again. Arguing back and forth, over and over, about which framework they should choose for their next big project. She had seen this many times before. Team meetings where two people would debate about what to do while the rest of the team observed, their heads bopping from one side to the other like they were watching a tennis match. The meeting ends, and everybody leaves disgruntled, feeling like they were forced to take sides and argue their way to a decision. Meanwhile in the next conference room over, David sits with his product group, the same disheartened feeling creeping over him. His team’s problem is that they’re never able to make a decision — they spend all their time talking about the meeting! Gershawn thinks that they need to clarify the process more, Annabel never stops asking question after question, and when time is up, everyone walks away from the room with no decision made and no clear way forward. Have you ever been in a conversation like one of these? If you’ve been around the working world long enough, you likely have. Everyone faces the issue of unproductive conversations — times when your team has to get work done and move forward, but no one seems to be able to agree on how to get there. Worse yet, these kinds of conversations break down communication on your team. People check out, get frustrated, grandstand each other, and ultimately make decisions that aren’t even good ones. The trouble is, conversations are vital to your team’s productivity. From each conversation you have come the strategies, tactics, and decisions to move your work forward. Without conversation, work stops . Last fall our leadership team realized the importance of dialogue to how we make decisions, so they sat down with Peter Finkelstein, an organizational psychiatrist and management consultant, to learn more about how our teams could be more productive in our conversations. Peter is a Stanford-trained psychiatrist who, after 15 years practicing group and individual psychotherapy, began to apply what he had observed to the business world, founding his own leadership consulting firm, Upstart Logic, in 1998. In 2003, he started teaching at the American Leadership Forum in order to help leaders use dialogue in a skillful way, both in business and within other sectors like government and non-profit. He has been on the faculty of an Executive Education class called “Leading Change and Organizational Renewal” at the Stanford Graduate School of Business for nearly twenty years. Peter walked the team through exactly what a great conversation does, what it looks like, and a model for productive conversation that we can all apply to our teams and meetings. 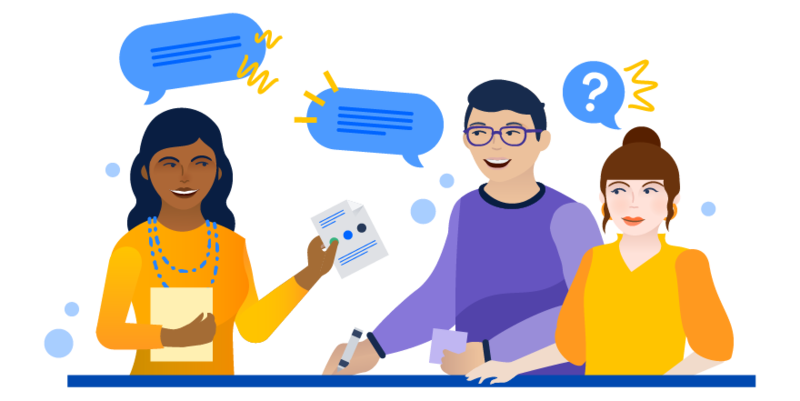 Great conversations help teams discover something new, surprising, or innovative that they couldn’t have thought of on their own, as individuals. That’s why we hold meetings! A spirit of learning. This curious and open-minded spirit is present in the most productive conversations. What is prized by everyone participating in the discussion should be learning and discovery, instead of winning or persuading. Lightly-held ideas. Grasping tightly to our own ideas automatically shuts our brains off from receiving other, possible better, ideas. Instead, people in great conversations don’t consider their viewpoint the be-all-end-all, and are willing to be taught, guided, and challenged by others. No judgment. We all come into the room with cognitive biases that color the way we see our work and decisions. Great conversations happen when people are aware of (and then let go of) their biases so ideas can flow freely. Everyone gets to talk. You know those meetings where one personality dominates the conversation? Yeah, those are not productive conversations. Great conversations are like ensemble theater where everyone plays an equal role in conversational support and turn taking. An understanding of conversational roles. In great conversations, there should be 4 roles functioning in order to bring out the best ideas. This is where the Four-Player Model of Dialogue comes in to play. 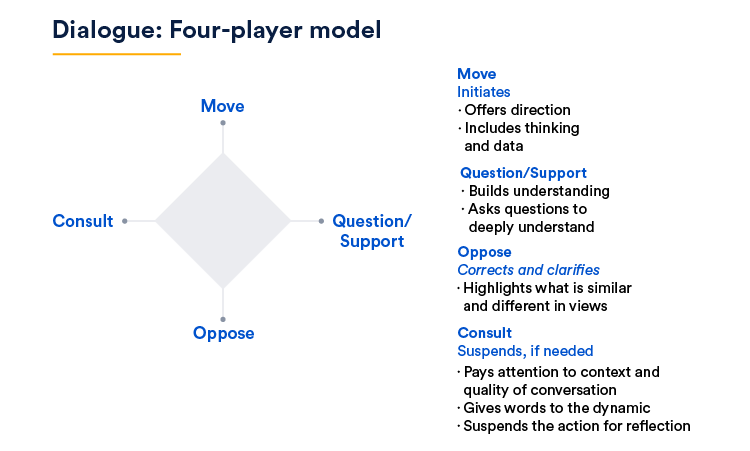 In our workshop, Peter walked us through the Four-Player Model of Dialogue, a framework developed by David Kantor, that helps you visualize the actions and actors present in a conversation, and how to balance out each role so that your team can have the most productive conversation possible. In great conversations, all 4 of these roles are represented. It starts with an idea, presented here as “move”, for example, “I think we should launch a new product”. Then, the opportunity arises to oppose the idea, (“I don’t agree”) or to question it (“Tell me more about why you think this way”). The consult role serves to regulate the conversation — noticing where people’s views are not being expressed or when the team is getting stuck. The value of this model is that it allows people to get out of some common conversational traps. The first trap is the Move — Oppose dynamic, endemic especially to technology companies. This is the issue Laura faced in her engineering meeting at the beginning of this post. One idea, then another, offered back and forth and back and forth until somebody tires of it, or changes their mind. What’s wrong with this approach is that it’s often a race to the bottom instead of a discovery of the best idea out there. On the other hand of the spectrum, and less frequently, it’s tempting for teams to fall into the Consult-Question dynamic, where ultimately no decision gets made. This is the scenario that David found himself in: with everyone talking so much about the conversation that no one actually made a decision. Your team doesn’t have to fall into either of these traps if you take the time to learn and practice the Four-player model. The value of this model is it helps us understand all the points of view present in a conversation and use them to our advantage. It is completely within each team’s ability to have healthy, balanced conversations where everyone plays the multiple roles of Move, Oppose, Question/Support, and Consult. Your team just needs to be aware how this model might work in your conversations, and realize how they can each contribute. By having healthier conversations, you can expect your team to unlock amazing ideas that no one had thought of before, feel the momentum of coming to a shared understanding and decision, and empower everyone to own the work of the team and believe in it for themselves. So share this dialogue model with your team. Print it out and bring it to your next meeting. Once everyone is familiar with the roles, ask each person to consider which role they tend to fall in, which roles they don’t, and how they can move themselves into all 4 roles to have better meetings. To learn more about Upstart Logic and how they’re helping companies do more together, visit their website. Originally published at Atlassian Blog.